Thousands of Venezuelans in cars and motorbikes have filled roads across the country in motorised protests against President Nicolas Maduro. Riot police on motorbikes fired tear gas against opposition demonstrators and blocked their motorcade in the capital, Caracas, where a bus was also set on fire. 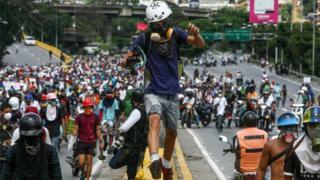 There were clashes in Valencia and other Venezuelan cities. Nearly 40 people have been killed since the unrest began six weeks ago. Mr Maduro has accused the leader of the opposition-led National Assembly, Julio Borges, of inciting violence by calling people onto the streets. On Friday, riot police clashed with elderly protesters at the so-called Grandparents March in Caracas. Opposition leaders say they will keep the pressure on Mr Maduro's government. "We are going to stay in the street, building a way out of the crisis," opposition lawmaker Freddy Guevara told AFP news agency in Caracas. The current unrest was triggered by a Supreme Court attempt to take over powers from the opposition-controlled National Assembly on 29 March. Its economy has collapsed, with inflation expected to top 700% this year and crime is rampant. Mr Maduro accuses the country's business elite of boycotting the economy to create unrest and topple his democratically-elected government. His term ends in January 2019.